"me and my shark fin"
Galeria is pleased to present the second installment from artist Spencer Keeton Cunningham, "me and my shark fin". "me and my shark fin" by Spencer Keeton Cunningham is part of 'The Great West Coast Shark Migration Art Tour', a traveling art benifit established by Pangeaseed with the aim to raise awareness and help educate the public on the importance of shark conservation and the preservation of ocean habitats. 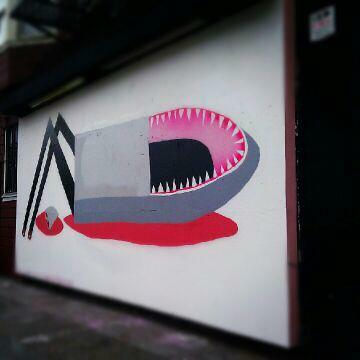 Cunningham's billboard is part of a video collaboration with artist Kool Kid Kreyola of the same name and draws attention to the brutal practice of shark finning.